Hey, friends! 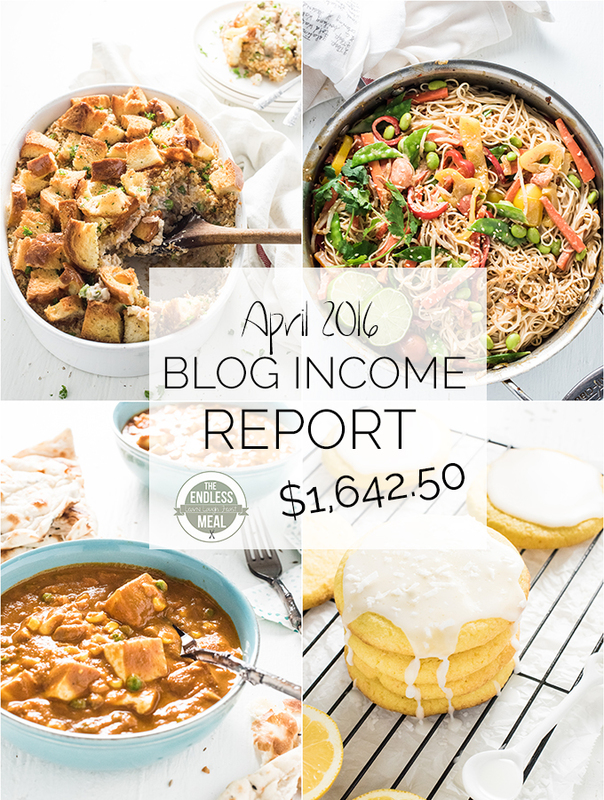 Welcome back to the blog income report series here on TEM. While most of the time you'll find me working behind the scenes cooking, talking pictures and, (let's be honest) eating, once a month I like to pop out here and share what's going on with this blog from a monetary and traffic perspective. It helps keep me on track with monitoring the financial side of running a blog. Transparency is honesty and, us being friends and all, I like to lay it on the line for you. There's a part of me that hopes I can convince you to start your own blog. Seriously, blogging is fun and I'd love it if you would join me. This month has been super nuts around here, both from a blogging and personal perspective. From the blogging side of things, there has been so much going on. The course that I created to teach people how to start their own blog has officially launched and students are a signin' up. Hooray! I started working with an ad optimization company which I'm super stoked to tell you about. There were two batches of Glazed Coconut Lemon Sugar Cookies made this month, which totally deserve to make it onto the list of exciting blogging things that happened.? There's no reason to skirt around the issue … ad optimization is a lot of work. There, I said it. Last year I spent a lot of time monitoring and adjusting the ads on TEM. Did I see results? Sure, but not much. I definitely didn't see enough monetary gains to make the time I spent on it worthwhile. Don't get me wrong, if you run a blog and use ads as one of your income streams, I think it is VERY important that you understand how ads work. There's a lot to know about CPMs and CPCs and waterfalls and ad placement and all sorts of other things. If you don't already have it, I recommend getting the eBook How to Monetize your Blog. It will answer all of you ad related questions. Seriously the best $15 I ever spent. Even though I think it's important to understand ads, I made the decision to stop monitoring them a few months ago. The result? TEMs ad revenue remained stable. AdThrive is an ad optimization company. 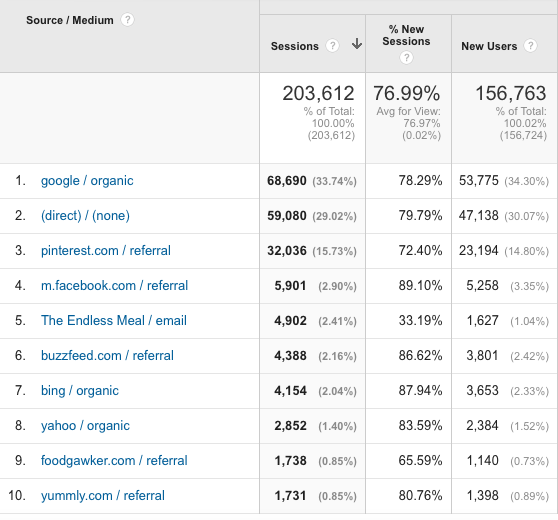 Ad optimizing is all they do. They are a small, but rapidly growing company, started by the husband of anther blogger. Not only do they get ads, they understand the needs and wants of bloggers. I've given them full rein to implement the ads they feel will produce the best results. 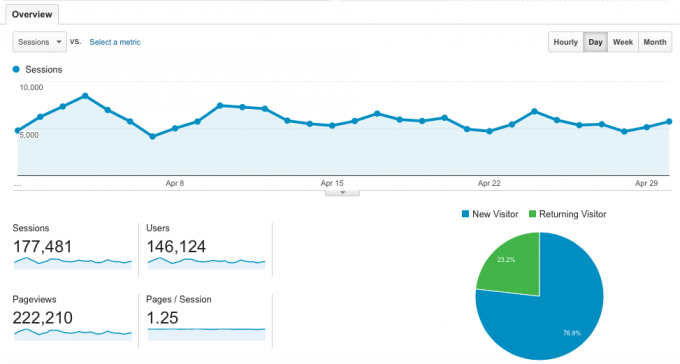 In the last week of April (when they took over) the revenue TEM earns from ads jumped 161%. These guys are pros. For the past few months, I've been creating a course called #OhMyBlog. It's an online course with 30+ videos that guide students through everything they need to know to start a blog. Each of the videos are action packed with no fluff in between. It's a course for people who have been dreaming of starting a blog, but don't know where to begin or how to do it. The biggest surprise (for me!) has been how active the private Facebook group for the course has been. The students are super engaged and really support and help each other out. It's been my personal favorite part of launching the course. And speaking of launching … I launched the course last week. Yippeee! While creating the course was a TON of work, in the long run it will add a (the first!) passive income stream to TEM. Thank you for joining me on another blog income report adventure. If you have any questions or thoughts, say hi in the comments below. See you again next month! Love these reports. Just wondering how many recipes you have on the blog now? Hello Kristen, great to know your improved income. Also very happy for the growing baby inside. Well, I wanted to know how can we sign up with adthrive? Do they accept everyone who has applied and how much do they charge.